Greetings from Karl Flammer Ford's automobile parts team! 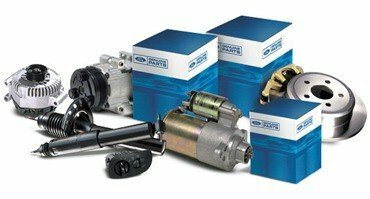 As the leading provider of authorized original equipment manufacturer (OEM) items for Ford in Tarpon Springs, Karl Flammer Ford has developed an identity for itself by supplying you with the component you need to tackle whatever service problem comes your way. Taking the conversation to the next stage, doing business with our group of respected Ford parts specialists means also having access to a wealth of knowledge and experience that you plainly will not find anywhere else. Regardless of whether you need guidance on the right part for the job or a little additional insight into how to get things into place, you can put your trust in the realization that the Karl Flammer Ford staff of parts experts will be ready to support you through each phase of this procedure. Interested in discovering more about why obtaining OEM replacement parts from Karl Flammer Ford is never a bad call? Then now is a good time to delve even deeper into the perks of connecting your parts business with the knowledge served up by the friendly and informative group of specialists operating here at the Karl Flammer Ford parts division. Before we dive headfirst into all of the facts regarding why OEM components from Karl Flammer Ford are always the right parts to use for your car restoration needs, it makes plenty of sense to first go over precisely what "OEM" means. In particular, only parts that originate from the manufacturer, Ford, are allowed to garner this designation. Despite the fact that other aftermarket companies might try and pass off their offerings as being of the same level of performance and durability as certified OEM parts, the truth of the matter is that the OEM part certification is a distinction reserved exclusively for replacement parts that adhere to Ford's rigid functionality and usefulness criteria. Is Obtaining OEM Parts a Wise Move? A Commitment to Quality That Is Without Peer – Ford OEM components must stand up to a series of demanding tests and inspections before ending up in your vehicle, so you know that quality and performance will never be an issue with these selections. Made Specifically to Tackle Ford Repair Work – While other parts suppliers might appear to take a page from Ford OEM parts, there is absolutely no way to ignore the inescapable fact that only approved OEM parts from Ford are designed exclusively with the specific features of your vehicle in mind. The Only Parts Located in Tarpon Springs Crafted by Ford's Lineup of Engineers – The same group of men and women that generated the blueprint for your current Ford automobile also came up with the groundwork behind the authorized OEM components sold here at Karl Flammer Ford, so it stands to reason that it is undoubtedly a smart idea to acquire parts that originate from this team of accredited Ford engineers. Protected by a Complete Manufacturer's Warranty – Ford recognizes that peace of mind goes a good distance, so you can be confident in the promise that OEM components from this manufacturer come with a customer-first warranty that supports you and your vehicle. The moral of the story here? Buying OEM parts directly from Karl Flammer Ford means investing in your car's future – and making sure the task gets done right at the onset. After reviewing everything that makes OEM parts rise above their third-party alternatives, it is time to unravel the next leading concern on your plate: Does Karl Flammer Ford have what I will need to finish off my repair? Simply put, the answer to this inquiry is most certainly yes! As you can see, when it comes to providing the people of Tarpon Springs with access to certified Ford OEM parts, there is no doubting that Karl Flammer Ford's supply of Ford OEM parts is second to none. At this time, you are no doubt ready to start working toward a successful car restoration and drive home with the appropriate OEM part for your upcoming projects. To begin the process of choosing the correct Ford part, you have a couple of tracks you can take. Up first, you can plan a trip to the Karl Flammer Ford parts department and have one of our trusted Ford advisors work with you through every detail of this important purchase. If Karl Flammer Ford has the part you need on hand, you can take it with you on the same day as your trip to Karl Flammer Ford; for all other acquisitions, we will be more than happy to submit your parts request to Ford and have the part mailed out immediately. Should you want to undertake this process digitally, feel free to fill out the OEM parts order form we have provided to you on this page. Once you do this, a member of the reliable Ford OEM parts crew will immediately get to work evaluating your inquiry and connect with you to confirm that you acquire the part you are looking for in a hurry. We appreciate you visiting the Karl Flammer Ford parts page and we are enthusiastic to help you sort through the best assortment of affordable Ford OEM offerings in Tarpon Springs.